Last Friday, children across the world came together to sing. 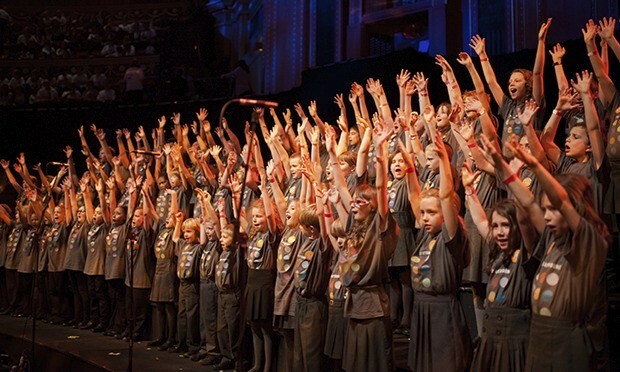 Friday Afternoons, a global project designed to promote singing in schools, began in 2011 as part of celebrations of the centennial of Benjamin Britten’s birth. Last year, 67,000 students around the world participated in the live-streamed event, organized by Aldenburgh Music. In the early 1930s, Benjamin Britten wrote a collection of twelve songs called Friday Afternoons for students at the Clive House School in Prestatyn in northeast Wales. The songs, which include “Cuckoo!” and the canon, “Old Abram Brown”, feature catchy, repetitive phrases and a strong sense of pulse, elements which appeal to young children. This year, in the spirit of Britten, twelve new children’s songs were written by composers including Nico Muhly, Rachel Portman, and the 14-year-old Zoe Dixon. Listen to all of the songs here and watch a segment of the event. The benefits are obvious. Children develop aural and rhythmic skills by singing and listening to music from an early age. This development can lead to a meaningful, lifelong relationship with music. Archeologists believe that music predated language. Throughout most of history, music was produced live and was experienced collectively. In an era of iTunes downloads and silent discos, Friday Afternoons restores the joy of collective music making, this time on a global level. Friday Afternoons offers us a great opportunity to evaluate our priorities. For too long, society has offered token support for music and arts education while simultaneously tolerated cliched statements like, “we just don’t have the money” or “we need to focus on basics to train a competitive work force.” The 1999 film Music of the Heart impacted emotions and ideals without translating into a deeper and more enlightened commitment to the role of music in a complete education. If the future of the world relies on peaceful cooperation between countries, educated, thoughtful citizens, and the unleashing of the creative force, what could be more relevant than an event like Friday Afternoons? At College of the Desert near Palm Springs we performed A Ceremony of Carols accompanied by harp, as scored. Fortunately for me, i was the piano accompanist for rehearsals. A few years later as a member of the Universty of Madrid Choir, I was chosen as accompanist as a harpist was unavaiable. So I was able to immerse myself in Britten’s masterpiece once again. Thank you for this post.